Oriental Medicine (acupuncture) and Massage Therapy training in Miami, Florida. Which career path are you interested in? Get the skills to become an Acupuncture Physician! Our acupuncture school in Florida offers an Oriental Medicine program that can be completed in 3-years and confers a Master's degree. Get the skills to become a massage therapist! Our massage school in Miami, FL offers a massage therapy certification can be completed in as little as 9-months. Consigue las habilidades para convertirte en un terapista de masaje! Nuestra escuela de masaje en Miami, FL ofrece un diplomado en terapia de masaje que se puede completar en 9 meses. Acupuncture and Massage College was established in 1983 as the first acupuncture school in Florida. Today, it is considered one of the leading colleges of Oriental Medicine in the nation and is known for its distinguished professors of Traditional Chinese Medicine, Asian Bodywork Therapy specialization, and its holistic approach to teaching integrative medicine. The college is licensed by the State of Florida's Commision for Independent Education and is accredited as a degree-granting institution by the Accrediting Commission of Career Schools and Colleges (ACCSC) and by the Accreditation Commission for Acupuncture and Oriental Medicine (ACAOM). 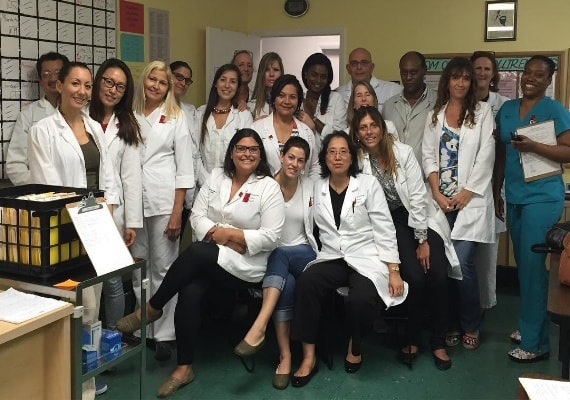 We have been training acupuncturists and massage therapists for over thirty years, and our graduates can be found at many of South Florida's leading clinics. The campus and our massage and acupuncture treatment clinic is located at 10506 North Kendall Drive, Miami, Florida 33176. For more information about the school or to make an appointment, please call us at (305)595-9500. To learn more about what we do at Acupuncture and Massage College, subscribe to our popular holistic medicine blog and follow us on Facebook. “AMC is one of the best professional experiences I’ve ever had. The faculty and staff are an integral component in the educational training of Massage Therapists." “What I learned at AMC has prepared me to become an outstanding and successful Alternative Care Physician...AMC prepares students to be acupuncturists and to heal in a deeper way." Not sure if you're ready to begin a new career? The journey of 1,000 miles begins with a single step. Take your first step toward a new career by downloading our course catalog. This is the perfect starting place for anyone wanting to learn more about our school and programs of study.